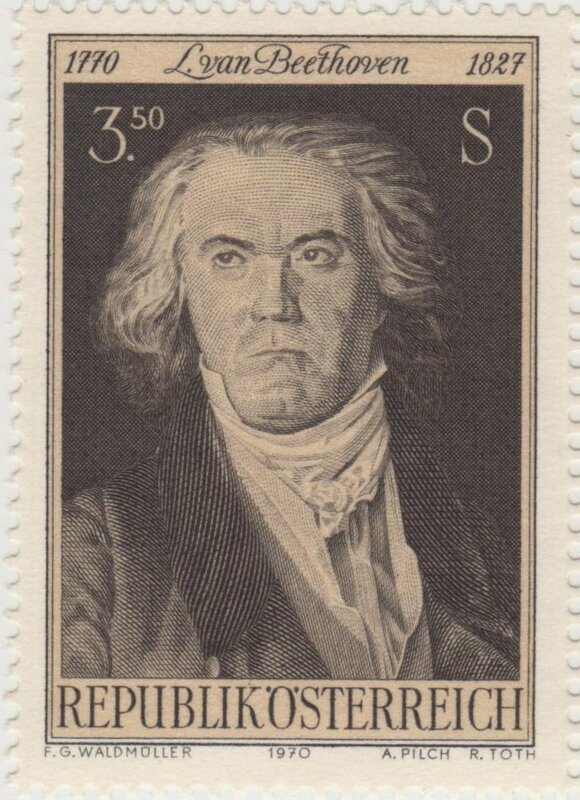 I hope to upload at least one stamp showing a composer (but can't currently as it is for the guess the stamp thread). I would be interested in seeing what everyone has gone in this theme though. Since I was looking at this stamp today, I thought it might serve well as a starter. One of many nicely engraved stamps from Czechoslovakia. As always, click on image for details. It features Calixa Lavallée, Adolphe-Basile Routhier and Robert Stanley Weir. Lavallée who was the composer of "O Canada", had a long and varied career in the music industry. He wrote the music to "O Canada" for the 1880 Saint Jean Babtiste Day Celebrations. Routhier, wrote the French lyrics. In 1908 Weir provided an English version of the lyrics. The stamp was issued June 6, 1980 and is perforated 12½. A kind Postcrosser enclosed some stamps along with a postcard in an envelope. Here's the stamp. Henry VIII was a musician and composer. You can see a piece of manuscript on the British Library website. From time to time I make a slight hash of trying to play Beethoven piano sonatas. 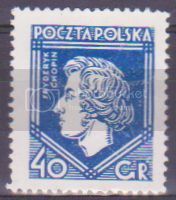 Here are some stamps with his portrait: one as a young man looking rather more tidy than in his more famous portraits. Female composers are often unduly neglected, and Clara Schumann, wife of the more famous Robert Schumann, is no exception. Even in her own time she was probably better known as a brilliant pianist. Here is a 1986 West German stamp with her picture. This engraving follows the portrait by Ferdinand Georg Waldmüller who was an Austrian painter and writer. He briefly attended the Academy of Fine Arts Vienna, but later had to finance his life by painting portraits. Strauss Jr., also known as "the waltz king" in Austria. Austria has been associated with far more than its share of great composers. In 1922 it issued a set of seven stamps in aid of the Austrian Musicians' Fund. Here are the first four, showing (left to right) Haydn, Mozart, Beethoven and Schubert. They didn't name the composers on the stamps - maybe they could safely assume Austrians would recognise them. I think the portraits are magnificent. The other three composers will follow in my next post to this thread. ... and here are the other three composers in the 1922 Austrian set: left to right, Bruckner, Johann Strauss (with his trademark moustache), and Wolf. Think of Poland, think of Chopin. Here he is, resurrected in 1927. 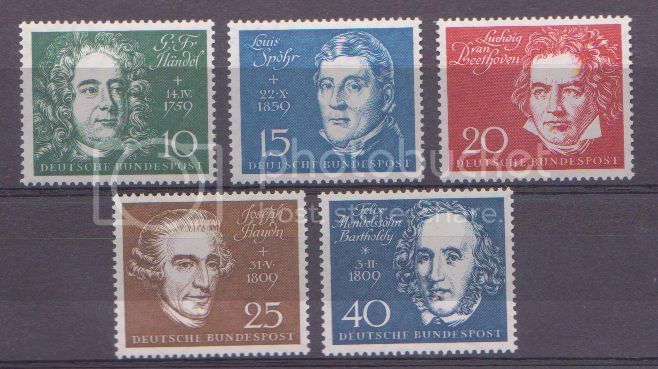 In 1961 East Germany issued a set of stamps to mark the 150th anniversary of the birth of Liszt. Here they are. From left to right, Liszt and Berlioz; the hand of Liszt as a young man (image of part of a statue - a bit macabre? ); Liszt on his own; and Liszt and Chopin. You can see why ladies swooned over Liszt when he went on his concert tours. Do I have your permission to 'make' a stamp with my favourite composer on. I cannot find a real stamp with him on, but it would be fun to create one, I would not try to pass it off as a real stamp. Eugene-Auguste Ysaye. 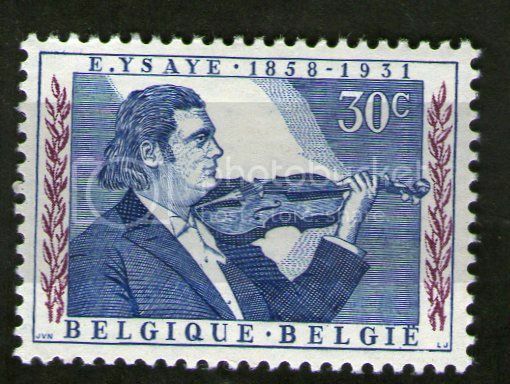 Belgian - Violinist, Conductor and Composer. 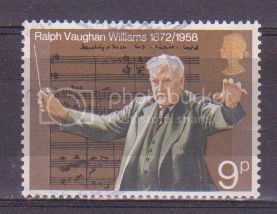 A 1972 stamp from the UK to mark the birth centenary of Ralph Vaughan Williams.